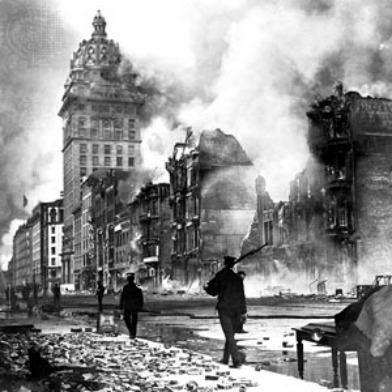 One of the three remaining known survivors of the 1906 earthquake and fire in San Francisco passed away earlier this week. Winnie Hook, 107, died at her home Tuesday, according to her family. Hook will be honored today at a noontime ceremony at John’s Grill, located at 63 Ellis St. in San Francisco. A fire truck will ring its bell at 12:30 p.m. for Hook. William Del Monte, 107, and Ruth Newman, who will be 112 this fall, are the two remaining survivors of the 7.8-magnitude earthquake that shook the city at 5:12 a.m. on April 18, 1906. As many as 3,000 people died in the aftermath of the temblor, which sparked massive fires that burned and destroyed large swaths of the city. On the anniversary of the quake, it has been tradition for the survivors to gather at Lotta’s Fountain at Market and Kearny streets in downtown San Francisco for a commemorative event. However, this year was the first in which none of the survivors were able to make it to the early morning event because of their advancing ages.